Thanks to Caltiva Creatividad for the image. I’ve always found it fascinating that there is such a narrow band around a sun in which life as we know it can exist. 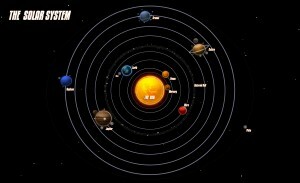 Venus is too close to support life and Mars is too far away. Only Earth can support life in our solar system. Could there be a similar range of preconditions that make your ministry viable? If so, would understanding what the preconditions are be helpful when thinking strategically about your organization’s continued viability? I think so. I’ve finished seeing people in Australia today and comparing their perspectives with those of the New Zealanders I met with last week I had a thought. I’ve been asking everyone how well they feel Christian ministries are supported for their organizational needs. In other words, is there a need for an organization like CCCC to exist? I ask this not to test the waters for an international CCCC (Canada keeps us busy as it is), but to better understand the basis of our existence here in Canada. Why not a CCCC-like ministry? There is absolutely no need for a CCCC-like organization in New Zealand, but the Australians are crying out for one (and fortunately there are at least two organizations that could develop along the lines of CCCC). It seems that part of the difference relates to population size. In New Zealand they have only two degrees of separation between everyone, not six as the rest of the world seems to have. At four million people, connections between ministry workers, and between them and government workers, are quite close. No one in ministry is alone. Help is always at hand, and a lot gets done either informally or ad hoc. (There are other factors in play as well, but I’m using population as the example.) Australia’s population is about twenty-four million, I’m told, and it does not have such close relations between people. So they need a representative and they need someone to help them. If a critical mass of population is the precondition for a CCCC-like organization to be created, then surely the United States would have a CCCC-like ministry, but it doesn’t! Why not? Because they are sooooo BIG that much more narrowly-focused organizations are viable. Canadian organizations typically must be much broader in their range of services than their American counter-parts in order to be viable. The US certainly could have a CCCC, but it doesn’t have viability as the driving force to create one. Several organizations can do the job we do between them and each be viable within its more limited focus. Why does your ministry exist? Now here’s the point: recognizing the importance that population size plays in birthing a ministry like CCCC, deeper reflection on why one population size creates a CCCC and why another one does not points to some critically-important strategic strengths we have that absolutely must be maintained and even strengthened further. It highlights what must not be lost. It makes us aware of the significance of things we may have not noticed before or not fully-appreciated. At the other end of the scale, thinking about the United States helps me understand better the Unique Selling Propositions that we have that more narrow support ministries do not have. We need to keep those front and centre in our strategy as well. What are the necessary preconditions for your ministry to exist? You might not know what they are until you do as I am doing – go visit places where you do not have a counter-part, and find out why you don’t have one there. I’d like to thank the people I met in Australia. They were Nathan Brown, VP and GM of Dunham & Company (fundraising consultants); George Aghajanian (and his staff), executive pastor of Hillsong Church; Graeme Kirkwood, president of Global Church Solutions (management consulting); Gary Williams, executive director of Christian Management Australia (thanks for the speaking engagement, Gary! ); Anne Robinson, partner of Prolegis (a top-notch charity law expert); Cathryn Finney Lamb, principal of Voice2words (marketing consultant for ministries); Janice Collins, executive director of International Teams; and Rob Owen, executive director of Mission Aviation Fellowship. Illness and circumstance kept me from seeing two more people who I intended to see, so I’ll catch up by phone with them and several other names I was given when I am back.